This column appears in the February 2013 issue of the SC United Methodist Advocate. I thought that sharing some information about why the Methodist Church split before the Civil War would be interesting. For nearly 100 years, the Methodist Episcopal Church was divided into northern and southern wings. Sixteen years before the southern states seceded, the southern Annual Conferences withdrew from the denomination and formed the Methodist Episcopal Church, South. What could have caused such a split? From its earliest days, Methodists debated the issue of slavery. More precisely, they tried to decide what relationship the church should have to the peculiar institution in a country where slavery was legal, and in some parts of the country, widely supported. Methodist conferences even before the first General Conference spoke out against slavery, suggesting that clergy who held slaves should promise to set them free. Several General Conferences struggled with the issue, first pressing traveling elders to emancipate their slaves, then suspending those rules in states where the laws did not permit manumission. By 1808, General Conference threw up its hands, finding the subject unmanageable, and gave each Annual Conference the right to enact its own rules relative to slaveholding. The denomination remained divided on the subject of slavery, with some northern Methodists becoming more convinced of slavery’s evil and some southern Methodists more convinced that it was a positive good. Other southerners felt that any denunciation of slaveholding by Methodists would damage the church in the South. They were caught, in effect, between church rules and state laws. 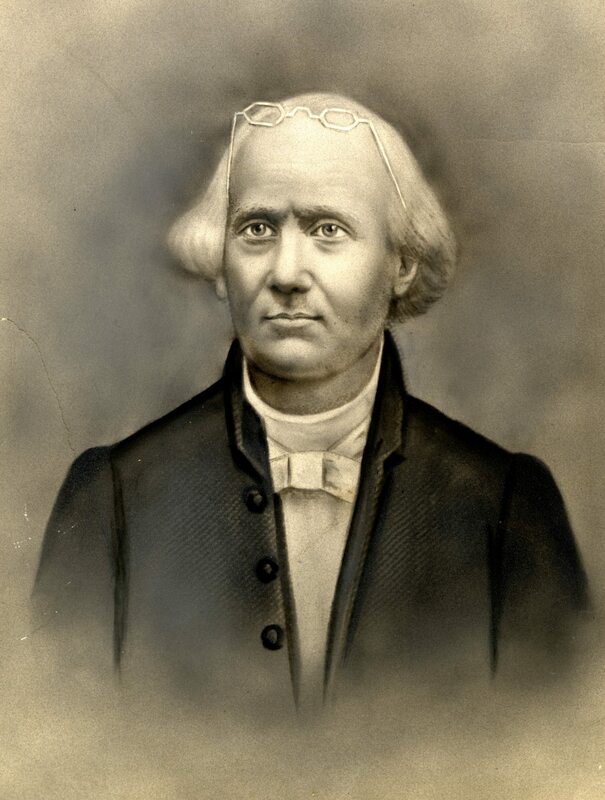 The spark that caused the division came when Bishop James O. Andrew, a native and resident of Georgia and a former member of the South Carolina Annual Conference, married a woman who had inherited slaves from her late husband. Many northern Methodists were appalled that someone with the responsibilities of a general superintendent of the church could also own slaves. This was the main topic of debate when the General Conference convened in New York City on May 1, 1844. The six week session would be the longest General Conference in Methodist history. Bishop Andrew learned of the impending conflict as he traveled to New York, and he resolved to resign from the episcopacy. However, the southern delegates persuaded Andrew that his resignation would “inflict an incurable wound on the whole South and inevitably lead to division in the church.” When the conference convened, Bishop Andrew was asked for information on his connection with slavery. A group of northern delegates proposed a resolution that the bishop was “hereby affectionately asked to resign.” Some took the position that the bishops were officers elected by the General Conference and could be asked to resign or deposed by majority vote. Others took the view that it was a constitutional office and bishops could be removed only by judicial process. A substitute resolution by one of the bishop’s friends, an Ohioan, asked the bishop to desist from exercising his office as long as he was a slaveholder. After a 12-day debate, other efforts at compromise, including one that would have allowed Andrew to serve wherever he would be welcomed, failed when it became apparent that the New England conferences would secede if it passed. One of the prominent speakers in the debate was William Capers, who was the leader of South Carolina’s delegation and a future bishop. The motion asking Andrew to desist from serving as a bishop ultimately passed, 111-69. General Conference then worked through the beginnings of a plan of separation. Annual Conferences throughout the South sent delegates to a convention in Louisville in May 1845, where they formed the Methodist Episcopal Church, South. For the next 94 years, the two strands of the Methodist Episcopal Church operated separately. Their separation was one of the turning points on the road to the Civil War, for the Methodist Church was one of several national churches and institutions that broke apart because it could not withstand the growing tensions surrounding the divisive issue of slavery.